Alter ego personality clashes are uncommon among most….. FALSE!!! In my opinion- everyone has at least two personalities within whether they identify with it or not. Now take someone with Multiple Palate Disorder and an overriding sensation of being spoilt for choice, with 11 cuisines fighting for ones palate sample at La Fayette Gourmet, Dubai Mall and you would understand the term- Sensory Overload. A sanctuary, right within a bustling mall that serves the likes of lip smacking Rotisserie, Moroccan, Italian, Asian, Sushi Art, Indian, Grills, Mediterranean and mouthwatering beverages to choose from it really sends even a seasoned palate into a tantalising tease. To segregate the meal let me first start off with a out of bed kickstart- Turkish Coffee. As the famous Turkish proverb goes; “Coffee should be black as hell, strong as death, and sweet as love”. I love the traditions that go along with the way one consumes a Turkish coffee- the meticulous details followed. There’s a certain way of preparing it. Other than having Turkish coffee beans, you need small coffee pot (copper is recommended) called “cezve” and Turkish coffee cups (thin porcelain cups like espresso cups) called “fincan”. If the beans are not ground, a Turkish coffee grinder (kahve degirmeni) is required for that smooth flow and taste to boot. 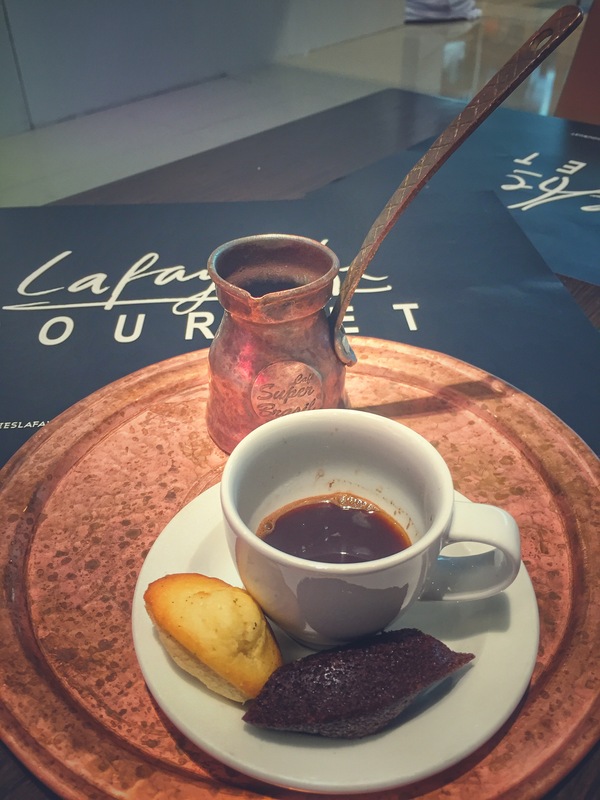 Note: If you are not making your own Turkish coffee but being served, let the host/waiter know in advance how much sugar you want in it. It can either be served as sade (without sugar), az sekerli (a little sugar), orta (medium sugar) or sekerli (sweet). Steeped deep in tradition, after drinking the coffee, there’s another waiting for the ones who like fortune reading. This tradition of reading someone’s future from the coffee grounds is called “fal” and very popular in Turkey. They say “Don’t believe fortune telling but don’t be left without it”. Did you know? Back in the old times when a woman was asked for marriage, potential husbands were served coffee and allowed to judge whether the woman was a good match for marriage based upon her ability to make coffee. Some prospective brides used to add salt instead of sugar in order to avoid an unwanted marriage. And if they wanted to end the marriage talks, they used to spill coffee over the guests. Even today, in modern Turkey, some people still keep traditions alive. If the coffee didn’t jumpstart my senses the next serving sure did. Lafayette Wasabi prawns with mango salsa. 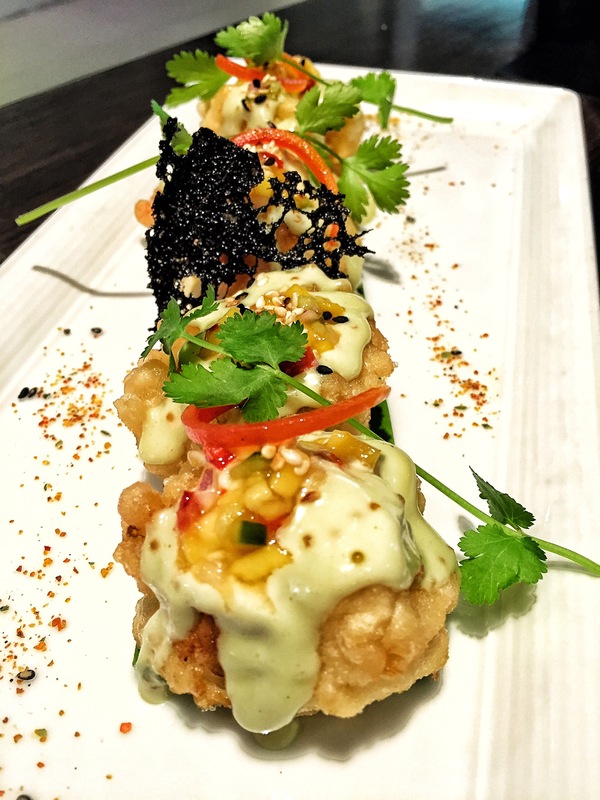 Aptly described as a ‘riot’ to ones olfactory senses- succulent crunchy farm fresh prawns coated with a wasabi dip and sweet mango salsa. The first reaction is the crunch followed by the tingling hair follicles stimulated by the wasabi dip and the mango salsa playing agony aunt to ones singed tongue. This is a dish that hits the spot- in a matter of literal speaking. 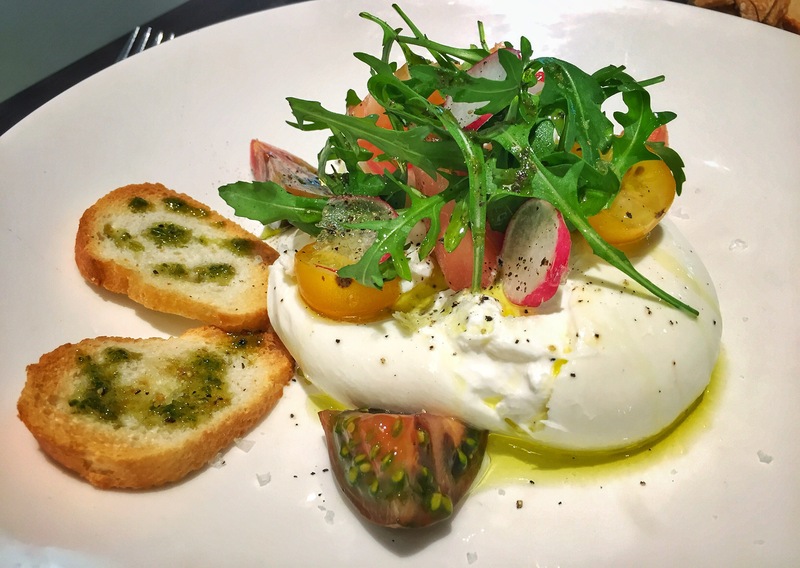 Something to cool oneself down with an Italian salad had its calling in the Burrata mozzarella with heirloom tomatoes and gazpacho vinaigrette. 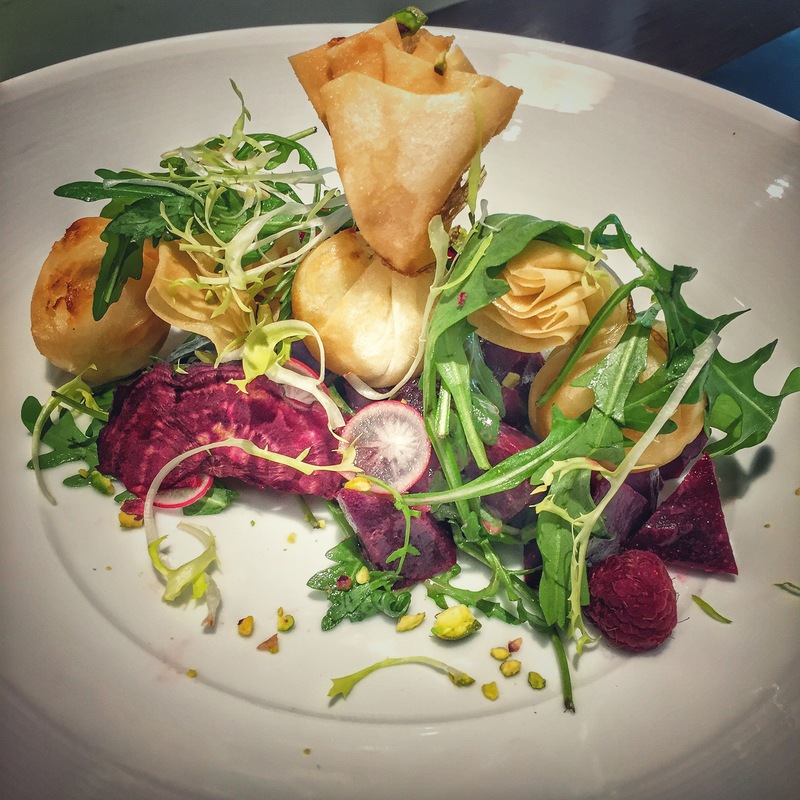 Nearly consumed yet craving for more I decided to skip dessert with more focus on the Warm Goat Cheese parcels with roasted beetroot salad, rocket leaves and raspberry vinaigrette. Yes I can see all you folk rolling your eyes in wonder at a first- (no dessert? ), just goes to show how M.P.D skewed the food made me. It made me switch loyalties. Sigh!!! I go shoot myself now. Anyhow before I do, imagine an old Chinese uncle taking you to a decrepit attic on your 18th birthday and handing over a silk tightly enclosed parcel with ornate wonders and treasures within (not the creepy kind, think more like The Emperor Tomb from The Mummy franchise) – the sense of entitlement and satisfaction consume you all at once, with the warm goat cheese gushing and urging you to consume each parcel whole (no droplets of cheese will be wasted) with the roasted beetroot and raspberry vinaigrette laying a smooth tarmac of sweetness to accompany the fermented cheese atop ones tongue. It’s no wonder with creations like these, that this establishment has its ‘faithful‘ heading back to their doors for more, time and again. I look forward to my next dessert for Round 2.